Conducting an interview for ‘Being Mortal.’ Boston, July 2013. 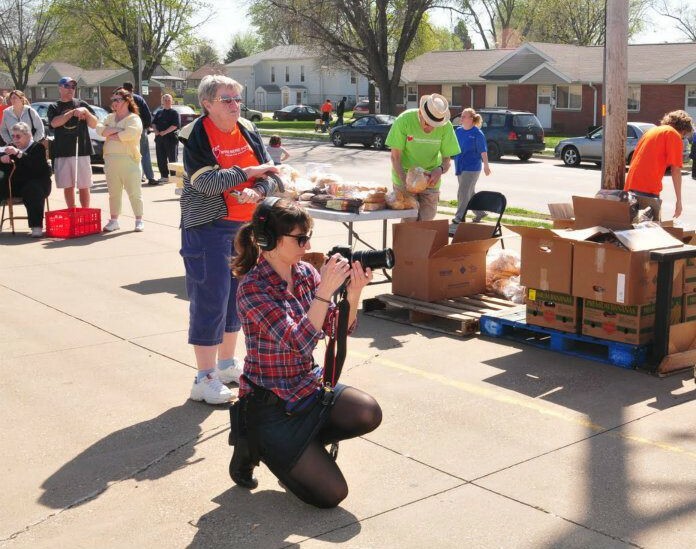 Filming a food pantry for ‘Poor Kids’ in Moline IL, March 2012. Lauren’s other producing credits include several award-winning independent films, and for series and specials at CUNY TV in New York, where she was a Producer and Director of Development for this public university TV station for 9 years. She is also an educator, having served as a film studies instructor and curriculum writer for the CUNY College Now program, and as the co-founder/co-instructor of a youth filmmaking workshop in Brooklyn that ran from 2006-2011, in partnership with Make the Road New York. Lauren is the recipient of grants from PSC-CUNY, the Brooklyn Arts Council and various New York City foundations, and she has been an invited speaking artist at numerous schools, colleges and museums. Lauren holds an MA from The CUNY Graduate Center, where she focused on documentary film studies, and a BA in English and Communications from the University of Pennsylvania. She speaks English, Spanish and French.